Ole Gunnar Solskjaer is the new interim boss at Manchester United, taking over from Jose Mourinho, who was sacked on Tuesday. The former Norway international returns to Old Trafford having spent 11 years at United as a player between 1996 and 2007, before going on to manage Molde and Cardiff City. Solskjaer, who started his coaching career at United by taking charge of their reserves, has been installed as Red Devils boss until the end of the season, after a dismal first half of the campaign led to Mourinho's dismissal, with a 3-1 defeat at Liverpool on Sunday proving the final straw. Here, we assess Solskjaer's playing and managerial record in league football, using Opta numbers. 235 – During his 12-year stint at Old Trafford as a player, Solskjaer made 235 top-flight appearances for Sir Alex Ferguson's side. Often dubbed a "super sub", the striker made a surprisingly high total of 151 starts, accumulating 13,927 minutes played. 91 – Solskjaer quickly became a reliable port of call for United when in need of a goal, and the Norwegian scored 91 times in the Premier League, providing 37 assists. 183 – His first venture into senior management came with Molde, the club that United signed Solskjaer from in 1996. Over two spells at the club, the 45-year-old has taken charge of 183 league games, winning the Norwegian title twice, in 2011 and 2013. 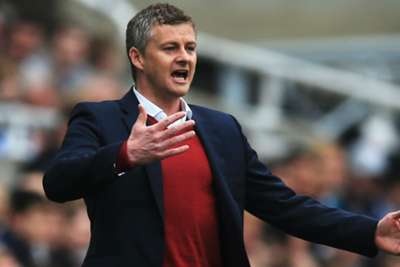 3 – Solskjaer's first spell at Molde ended when he joined Cardiff in January 2014, but he failed to keep the Welsh side up in their maiden Premier League season, taking charge of 18 games, and winning just three. 42 – While Solskjaer's Molde team had been renowned for its attacking verve and high goal tallies, his Cardiff side scored just 17 during his time in the Premier League, and let in a massive 42 at the other end; an average of 2.33 goals conceded per game. 322 – Over his two stints in charge of Molde, the Eliteserien side have scored 322 league goals. That is exactly 100 more than they have conceded. 49.5 – In total, Solskjaer has won 49.5 per cent of the 208 league games he has overseen as a manager during his time at both Molde and Cardiff.